Iowa State students prepare to deploy their robots for another run through the mining arena at NASA's Kennedy Space Center. Larger photo. Photo by Cyclone Space Mining. 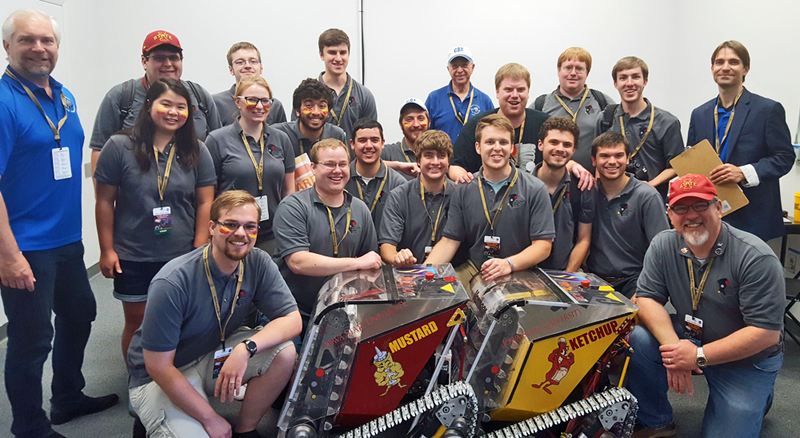 AMES, Iowa – The student-engineers of Cyclone Space Mining crowded around their prototype, soil-scooping robot. It was assembly time in a campus lab and as new parts went on, the students hooked up a few wires and did some quick tests. And this test wasn’t going so well. The newly installed metal tracks weren’t rotating. What could it be? Were the wires connected? Was the drivetrain somehow jammed? Were the new, lighter, more powerful motors OK? Mechanical engineering students Taylor Tuel, a senior from Shelby; Nick Hasto, a senior from St. Charles, Illinois; and Jason Boblit, a senior from Spencer, double-checked the setup, did a little pushing and pulling and went into full problem-solving mode. Turns out part of the drivetrain wasn’t assembled properly. They pulled out their tools and started on a fix. They didn’t think it would be much of a setback. And that’s good because they don’t have a lot of time for tinkering. NASA’s Robotic Mining Competition is May 16-20 at the Kennedy Space Center Visitor Complex in Florida. It was time to get going on their ambitious plan to build a two-robot mining system. The annual competition challenges teams of university students to design and build robots capable of working a simulated Martian landscape: The robots travel across the rocky, bumpy surface; they collect as much grit and gravel as they can; then they haul hoppers full of soil to a dumping area. If there’s time, the robots can make multiple trips across the dusty arena. And, if the technology is really working well, teams can try to collect loads of bonus points by letting their robots run autonomously. The students’ ideas could end up on a NASA mission: “NASA will directly benefit from the competition by encouraging the development of innovative robotic excavation concepts from universities which may result in clever ideas and solutions which could be applied to an actual excavation device and/or payload retrieval mission,” competition organizers wrote in the event’s rule book. Iowa State has a solid history of robotic mining innovations and solutions. The team won top honors in 2013. 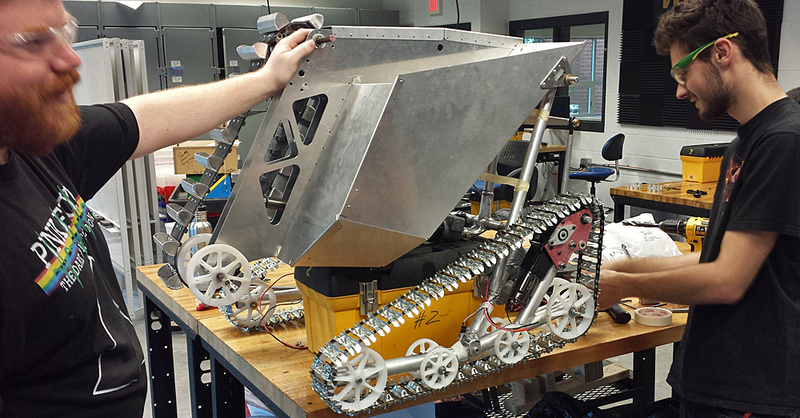 The following year, the team completed the competition’s first fully autonomous mining run. Last year’s team, however, struggled with some mechanical issues. To climb back to the top of the standings, this year’s team plans to deploy two robots in the mining arena. That’s allowed under contest rules, as long as both robots fit within the simulated mission’s cargo box. 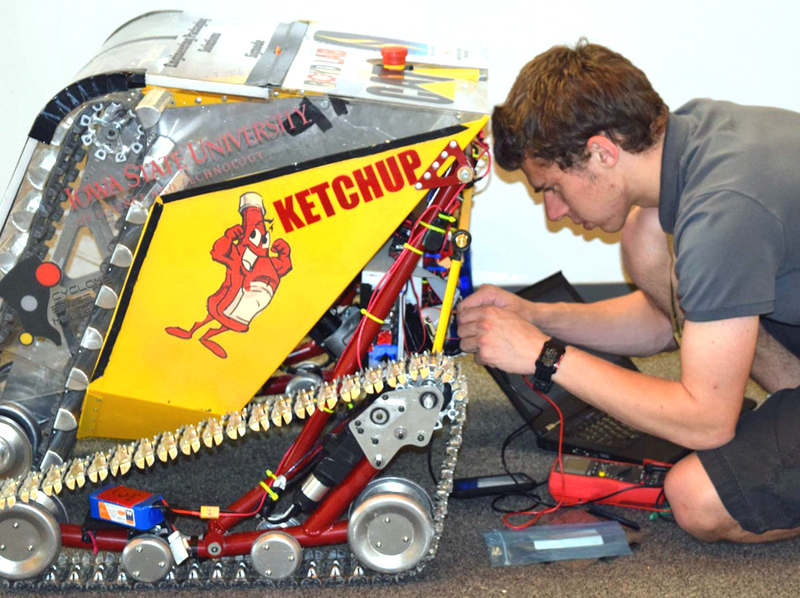 With a long list of upgrades, team members expect their new robots to be very competitive. There are now stamped-metal tracks, a suspension system, electronic track-tightening technology, better electric motors and a single actuator to raise and lower the scoops and hopper. As he looked over the shop – where team members and May graduates Dan Miller, Tyler Broich and Alex Grant were busy with robot assembly – Huk said he’s optimistic about the team’s trip to NASA. Engineering students Jason Boblit and Nick Hasto, left to right, assemble and test Cyclone Space Mining's latest robot. Larger image. Iowa State student-engineers are investing long hours in the design and assembly of their space-mining robots. 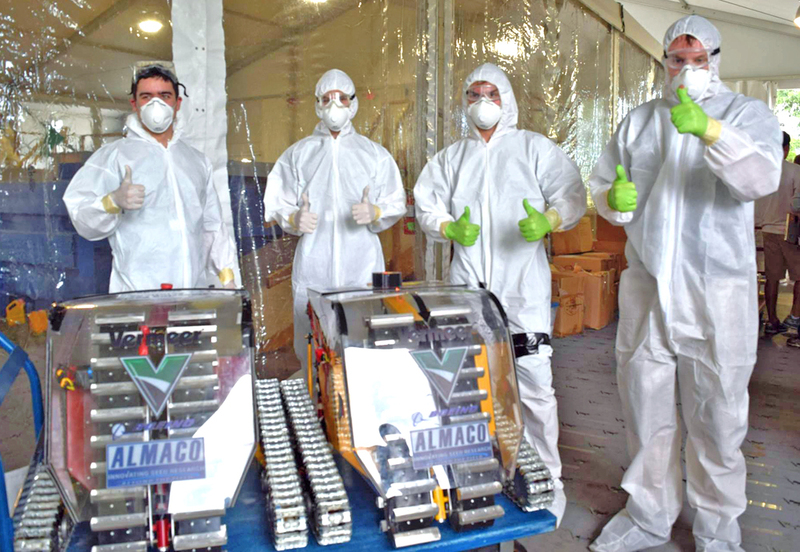 The students will deploy their machines May 16-20 at the annual NASA Robotic Mining Competition at the Kennedy Space Center in Florida. The students like the technical upgrades they've made to this year's robots -- including metal tracks, a suspension system and better motors. And they think their two-robot mining system could be a great way to collect a lot of simulated Martian soil.